For New French President, Germany Is First Stop Francois Hollande and German Chancellor Angela Merkel have different ideas about how to address Europe's financial turmoil. Their relationship will help set the tone for what happens next in Europe. And Hollande and German Chancellor Angela Merkel have different views on how to extricate Europe from its worst postwar financial crisis. 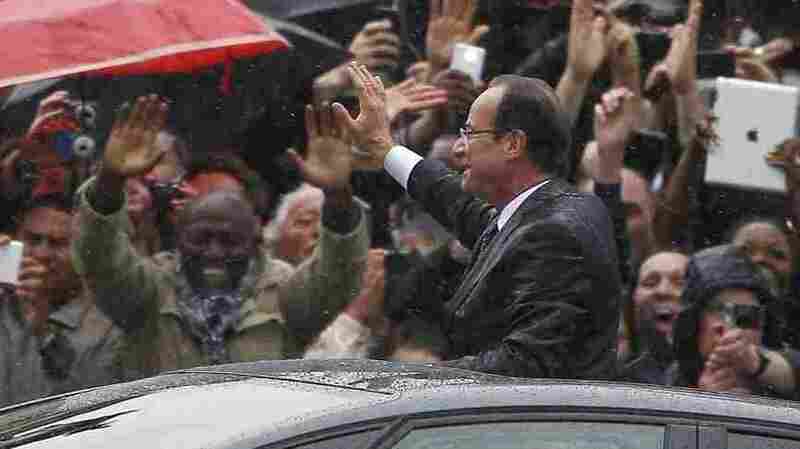 Before leaving Paris, Hollande told supporters that people are watching to see which direction Europe takes. "To overcome the crisis, Europe needs projects, solidarity and growth," he said. "To our partners, I will propose a new pact that will lead to the reduction of public debts by stimulating our economies." In reality, the get-together with Merkel amounted to crisis talks as much as a get-acquainted meeting. At a press conference after their meeting, Merkel signaled a willingness to at least talk about growth ideas. "I look forward to the fact that we have agreed to work through the various ideas on how growth can be achieved," she said. "I'm fully confident that we share more in common when it comes to growth, even if there is the odd difference of opinion between us." To overcome the crisis, Europe needs projects, solidarity and growth. To our partners, I will propose a new pact that will lead to the reduction of public debts by stimulating our economies. For his part, Hollande said that "anything that can contribute to growth, improving competitiveness, investment for the future, mobilizing funds, Eurobonds, everything has to be examined. And then we'll draw the conclusions." The two leaders also said they hope Greece, despite its massive troubles, stays in the eurozone. The Greek political and fiscal mess, and deep worries about Spain's debt-burdened banks, have renewed stark talk about Greece's possible exit from the euro and fears of a financial catastrophe stretching across the continent. Meanwhile, Germany's main opposition party, the Social Democrats (SPD), has been emboldened by a big regional election win and by the Hollande's victory. The Social Democrats on Tuesday made demands for what they called a growth and investment pact in exchange for supporting parliamentary passage of a Merkel-designed European fiscal pact that sets firm debt limits. SPD leader Peer Steinbrueck, a former finance minister, said at stake in the crisis was nothing less than the European project of postwar cooperation. "In my eyes, the bottom line is whether we continue with the European project, one that has seen 60 years of integration, prosperity and peace — or whether we let it fall apart and into the hands of dangerous nationalists," Steinbrueck said. "Crises eat away at democracy. It will cost money to stabilize Europe, and it is money well spent." Despite the tough talk, the German opposition is against new stimulus projects that would boost public debt — which is the same position as Merkel. And the Social Democrats offered no specific growth proposals beyond ones that have been discussed for months: using European Investment Bank credit for infrastructure projects, and creating a financial transactions tax. Mark Hallerberg at Berlin's Hertie School says those projects, however sound, will take years to get going and are likely to prove insufficient. "There aren't many shovel-ready projects. We're talking longer-term growth," he says. "This is not going to address the crisis. It may over the medium term help out Europe, but this isn't a magic bullet to solve the problem. It is however, rhetorically, something that politicians can use. So the search continues for viable growth plans, he says, that aren't just gimmicks.